Hidden west coast treasure only 1 hr from Auckland, NZ. Come and discover Port Waikato and chill out with the sound of waves breaking and spectacular sunsets. This comfortable bach is an ideal retreat for couples or families and pets to unwind. Fully fenced with a big front lawn for a round of cricket! Safe for kids and pets (there is no need to leave your beloved 4 legged furry friends behind). 4 Bedrooms in the main house and a separate sleep out (sleeps 5) with its own DVD is great for the kids/teenagers! or xtras - we even have a bed for your doggy. We have recently added a 9 x 5 meter! 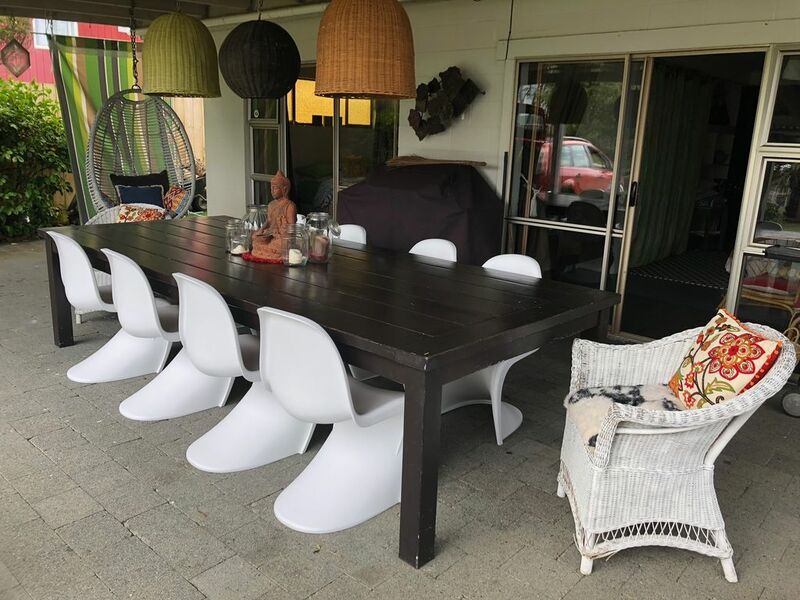 pergola at the front which offers a very large outdoor extended living area - and a 3.25 mtr table - superb for alfresco entertaining and large family gatherings. We are a five minute walk to the beach and takeaway/cafe. Idyllic black sand beach, riverside and sand dune walks (best child or dog playground around ever). Great spot for fishing, whitebaiting, surfing and a patrolled beach for swimming - or just come, kick back and relax! or let the wonderful west coast clear away the cobwebs or stress. Fully equipped kitchen with 90cm stainless oven and gas hob / brand new double door refrigerator. Wood freplace for cosy winter stays we supply the wood! - treat yourself with a wild west coast beach walk and let the wind blow away your stress.... pure magic! 2 night minimum stay - Public holiday weekends and school holidays have a minimum of 3 nights stay. Xmas / New Year period is a minimum of 5 nights stay. Bring own top/bottom sheets, pillowcases and towels - FULL bed linen and towels can be supplied at an additional cost ($15 per person). Smoking outside only and pets are very welcome but are not permitted on furniture. Rate is for 6 occupants, extras are $15 per night (maximum of 10). Cleaning fee of $100 per stay is additional / BBQ must be left as found! I loved w.e. breaks away - travel in general. I have travelled extensively in my past and love to welcome people from NZ wide to world wide! My place is laid out for having family and friends around the huge outside table and celebrating life. I love my dogs and this is a great place for your furry family..... and a great big outdoors for long lingering walks around the river or beach. I am one of not many dog friendly places. I fell in love with Port Waikato after my niece and her husband moved there. I didn't even know it existed until then. So 11 years ago I bought my lovely bach so I could enjoy 1.15 min drives for a w.e. break from Auckland. It is a wee gem.... a wonderful arty and creative community. You really feel like you are away from the world as it doesn't have many shops!! (one very cool general store) but it does have a cafe for your COFFEE FIX! dog friendly bach/off leash beach /great sand dunes for kids to romp down /surfers and boogie boarders Nikau Cave about 35 min drive.... very cool - google it if you are into caves. so happy you had a great wonderful Port experience - and I hope you return again soon. A pure west coast kiwi black sand and river treasure. Happy to host you. Great location. The house is spacious and very comfortable. Fabulous outdoor dining area for warm summer nights. It was a pleasure having your family and fur family return to the Port. Im glad you had a comfortable stay and that the wonderful weather was an additional treat for you. I look forward to your return visit to the Port and thanks for taking care of and leaving the bach so clean and tidy. Nice easy break from Auckland. Well appointed bach with everything we needed, in a great location. We appreciated the thought that has gone into making this a comfortable and attractive stay. Our teen boys loved the sleep out! If you visit, be sure to spend some time at Sylvia's cafe, and we really enjoyed a trip to Nikau caves. A pleasure to host these families and glad you enjoyed your stay and that all of your requirements were met. Always great to hear that the teenagers were well catered for! Nikau caves are another hidden gem in this area - a must if you love caves - plus the great cafe there. Hoorah for Sylvia’s Cafe - splendid food - well worth a visit or two! Great location, easy access to the beach with a short walk, close to Sylvia's Cafe. Bach was perfect for our group had lovely outdoor area with huge table which we spent most of our time at, room for children to play, safe a secure. The property is well equipped with lots of character. A reasonable walk to everything in Port Waikato. Very good for dogs and children. Our second time here and we will be back again! Sue is a great host in particular. We love this house so much.